There are dramatically more house fires in the winter months than there are during warm weather. Chimney fires are a major contributor to this sad fact but almost all of chimney related fires are preventable. 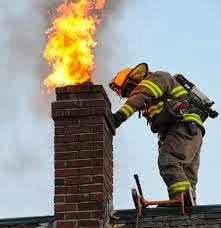 The first step you need to take to prevent this from happening to you is to inspect your chimney each fall before you begin to use the fireplace. This would involve making sure that the firebricks are in good condition and that the chimney itself is free of debris and creosote deposits (that black flaky deposit caused by burning wood). This should be done both from the top and bottom and for that reason some people prefer a professional inspection. It’s also important to have a working chimney cap that is free of deposits. Any debris can heat up and spark and that is an easy way to start a fire, even on a neighbors’ roof. Yearly maintenance is also a must to ensure that your fireplace or wood burning stove is safe to use. Cleaning the creosote deposits can be done using a stiff wire brush as far as you can reach. A chimney brush (available at your local home improvement center) will allow you to go well beyond arms reach when cleaning. You might consider measuring before buying one to ensure that you can clean the entire chimney. Cleaning your chimney will make quite a mess so be sure to block the front of the fireplace to keep debris from getting all over the room. Some people just use a large trash bag to cover the fireplace pit. When you’re done cleaning make sure to remove all of the debris from the fireplace before using it. After cleaning you want to make sure that you have proper ventilation so that the smoke and fumes leave your home and don’t reenter it. Carbon Monoxide build up is deadly serious. The easiest way to check for proper air flow is to simply blow out a match and watch where the smoke goes. It should travel directly up the chimney. If it does, you’re good to go. Most people don’t realize that burning the proper wood will dramatically reduce the buildup of creosote and help to keep the entire chimney clean during the winter months. Your best choice for firewood is wood that has been dried in direct sunlight over a period of time. Freshly cut wood creates a much higher amount of deposits that will quickly begin to obstruct the flow of air. Here’s a trick that’s well worth knowing! Burning an aluminum can from time to time will help to dry out the creosote deposits allowing some of them to exit harmlessly into the outside air. It is well worth your time to inspect your chimney even during the months that it is in use. Safety is no accident and a quick inspection with a flashlight will ensure that your home does not experience a fire that could have been prevented. Make sure that you have CO detectors installed in the proper locations and that they too are in good working order.